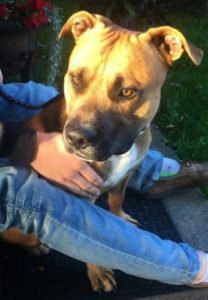 Additional Notes: MALE: AmStaff mix, adult, tan coat with dark shading on face, white blaze on chest, slight white tips on paws, wearing a collar, no tags. Found roaming on Oct. 8/18. Thank you to the finder for getting this dog to safety. This adventurer is now in the care of HRM Animal Control.